Oguz (Emre Kinay) is a 45 years old man who owns an advertising agency. After his wife passed away years ago, he never gets married and lives happily together with his three daughters. His eldest daughter Damla (Bahar Yanilmaz) studies at medical school and tries to do her best to take care of her sisters. His second daughter Ceren (Ece Cesmioglu) goes to high school and is carefree unlike her elder sister. His youngest daughter Merve (Zeynep Ozkaya) goes to primary school. Eda (Iclal Aydin), on the other hand, is a 35 years old woman who has divorced her husband upon his infidelity. She wants to start a new life with her two sons without getting any help from her ex-husband. Her eldest son Efe (Dogac Yildiz) goes to high school and still could not get used to the divorce of his parents. Her youngest son Timur (Akcahan Akca) goes to primary school and is torn between his mother and father. Eda wants to buy a house where she can live with her two sons in the upstairs while she can work at the downstairs as a pre-kindergarten caretaker. Deniz (Demet Evgar) is a beautiful and attractive middle aged woman who has been exposed to domestic violence for a long time. Her husband Hakan (Teoman Kumbaracibasi) uses alcohol and accuses his wife for preventing him to become a successful musician. Even though they have a wealthy life, Deniz does not have happiness and peace at home. She tries to be strong as much as possible and endure this violence for the sake of her only daughter Ecem (Eslem Akar). One day, during the fight, Ecem shoots her father while she is trying to protect her mother. Deniz does not want to let her daughter get a penalty and ruin her future. For this reason, she hides the truth and takes all the blame. Deniz is charged with the attempted murder of her husband and sent to prison. She leaves her wealthy life behind and is separated from her lovely daughter. She needs to learn how to survive in this new world that is unfamiliar to her. She is scared and finds herself in the middle of prisoners and prison officers. Mrs. Melahat (Melek Baykal) loses everything after her husband goes bankrupt and then passes away. 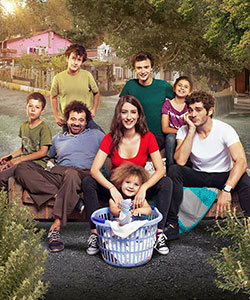 She and her daughter Tugce (Zeynep Dortkardesler) need to forget their wealthy life and start to find a way to survive. Their former driver Nuri (Zeki Alasya) learns their situation from the news and wants to help them. Nuri is a very old driver who starts his own taxi company after retirement. He is the owner of a taxi station named Akasya Duragi where many taxi drivers work. He acts responsibly for his former employer’s family and finds an old but a cozy house in his neighborhood. Mrs. Melahat and her daughter Tugce move in to their new house and start to have a new life in this friendly neighborhood.